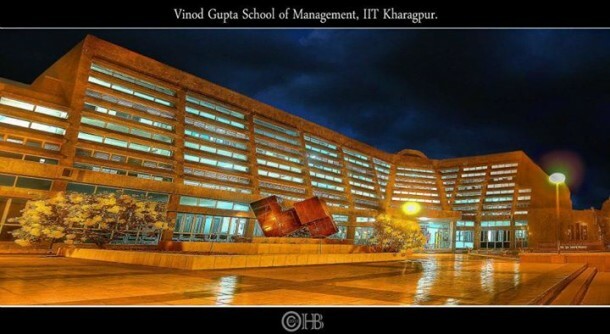 Vinod Gupta School of Management, Indian Institute of Technology, Kharagpur is the first and the largest B-School in the IIT fraternity. It was established in 1993 on the lines of MIT-Sloan School of Management with a mission to develop outstanding management professionals and technology driven future Industry Leaders. It is one of the best Business Schools in the country with a rich and diverse mix of people. The IIT Kharagpur campus is a place like no other where nature meets history in providing a nurturing learning environment that fosters education and research. The campus has been built with an aim to provide intellectual fulfillment and also maintaining harmony with the cosmic rhythm. In addition to the basic amenities like Library and Gymkhana, the institute also provides various support facilities like completely Wi-fi enabled campus, Banking and Postal services, Sports facilities etc. to help students pursue their over-all development along with studies and research without any hindrance. The facilities are centrally located for all the students within the IIT system and are open beyond the normal working hours. All the central facilities are well equipped with the necessary infrastructure and headed by a competent senior administrative staff. The School has highly qualified faculty members in the areas of finance, economics, operations and production management, marketing, computer information systems, strategic management and international management. In addition, faculty resources from other departments of the Institute are normally drawn upon for particular specializations. Distinguished visiting scholars and speakers from industry are invited to address the students. The faculty of the school is engaged not only in teaching MBA and doctoral programmes, but also in research and consultancy projects, as well as developing and offering short-term courses for practicing executives (MDPs). VGSoM offers between 50 per cent and 100 per cent fee waivers to 30 per cent students of each batch. This will be need-based and will be calculated on the basis of a student’s family income, among other benchmarks. With a low fee structure to begin with, this B-School is one of a kind when it comes to providing value for money and is arguably one of the country’s most economical MBA institute considering the over-compensating and ever-increasing placements scene. Our past recruiters include Reckitt Benckiser, Tata Motors, Berger Paints, ITC, Marico, P&G, Citibank, Siemens, Deliotte, PWC, Titan, HP, Axis Bank, Crisil, Wipro, Infosys among others. The School offers short duration programmes for practising managers in various functional areas. The purpose of such programmes is to provide an opportunity to executives to update their knowledge in their fields of expertise and also to help them acquire the knowledge, skills and attitude required to function in other areas where they may not have had any previous exposure. Management development programmes (MDPs) are offered at Kharagpur and in other cities in India. Specially customized programmes are also offered on request from specific organizations. Faculty members gain valuable experience through teaching in such MDPs, which is then used to enhance the quality of teaching in the MBA Programme. The annual industry-academia linkage programme- Entre’PACT is another major event. VGSOM saw the unveiling of its state-of-the-art Bloomberg terminal this year. The only college in the East to have this terminal. This would help analyzing real-time finance databases, market data and facilitate people place trades in the trading market. The college conducts free workshops for the students of VGSoM. It also provides students with professional training in various tools such as R, SPSS and various other platforms so that the students are industry ready and well equipped with knowledge. Vinculum, the annual day celebrations of VGSoM, is a unique initiative in which the whole VGSOM family comes together to celebrate the spirit of collaboration and the essence of being a VGSoMite. This one-day event consists of a multitude of events ranging from marathons to quizzes. The open IIT marathon with enthusiastic participation from the faculty members including the erstwhile dean of VGSoM, Prof. K K guin along with the cheerful students comprising undergraduates, postgraduates and research scholars, is a highlight. This is generally followed by a Treasure Hunt for the VGSOM students which witnesses deluging participation. Later in the day, there is a Faculty-Student cricket match followed by a massive inter departmental quiz contest with over 20 departments of IIT Kharagpur participating for the coveted trophy. There is an annual HR summit called ‘The Talk’, a Marketing summit ‘Marque’ and “Voice of Women” a womens leadership summit that are conducted by the CMI along with the regular course of guest lectures. Mr. Nehal Vora, Chief Regulator, Bombay Stock Exchange Ltd & several other dignitaries. Not only does VGSoM have a large alumni network for itself but also has the extremely large IIT Kharagpur alumni network at its disposal as well. The alumni help providing a lot of encouragement financially as well as emotionally courtesy of various alumni connect programmes and the annual alumni meet organized by the central IIT. Mr. Vinod Gupta, who founded the institution in 1993, is an alumnus of IIT Kharagpur himself. This goes to show the massive importance of the vast alumni database. VGSoM always encourages its students to pursue their passion. The students have over the years, assimilated this culture through and through and as a result of which the college has the following clubs catering to a particular field/interest to encourage and enable fruitful career progression for all. Each club also has an expert from the respective field as its faculty-coordinator who guides the club. As a part of Saamanjasya’13, Kalakaar Vikas provided a platform for artisans and craftsmen from Bengal , Orissa and the nearby regions to showcase their work of art which came in the form of outstanding creations like jewellery made of buffalo horns, jute chappals, wood carving, terracotta craft paintings, clay models so on and so forth. The event turned out to be a Celebration of Art and Creativity, with stalls throbbing with from all over India appreciating and endorsing the work of the artists. Workshops for micro-insurance and other creative skills were also conducted for these artisans to promote sustainability. As a part of Purvodaya, this year too, team Saamanjasya will organize this highly successful event to give the guests a visual treat through the marvelous works of the artisans from different parts of India and help preserve the diversity of art that forms an integral part Indian culture. Disha seema is a charity event where the students of VGS0M spend Diwali with underprivileged kids, bursting crackers, painting shirts, eating sweets and what not. VPL – VGSoM Premier League; yes it is what you think it is. A Cricket tournament along the lines of IPL is conducted every year and is nothing short of impending drama. 4 sets of team managers and players participate in an IPL – like auction that is streamed live. Post-auction, there are matches over the span of a month. A lot of strategies, tactics and a whole lot of fun are the constituents of the formula for the whole event. A mini football tournament- Futsal is also conducted every year in a similar fashion. Apart from the VPL and Futsal League there is also Racquets which includes all the racquet sport like Badminton, Table Tennis and Squash among others. You can check the facebook page of VPL. The place to be VGSoM. One of the best colleges in the East.